Generally the carbon content of ≤ 0.25% of steel called low-carbon steel, low carbon steel annealing organization for a small amount of ferrite and pearlite, the lower its strength and hardness, ductility and toughness, ease of drawing, stamping, extrusion, forging and welding, which 20Cr steel use more widely. The steel has a certain strength, this steel after quenching and tempering has good mechanical properties, good low temperature impact toughness, temper brittleness is not obvious. Uses: In the mechanical manufacturing suitable for the manufacture of welded structures and forged, hot stamping and machining parts without high stress in the steam turbine and boiler manufacturing multi-media work for a non-corrosive pipe, flanges, header and various fasteners; also applies to the manufacture of automobiles, tractors and general machinery manufacturing SMEs carburizing, carbonitriding and other parts, such as the hand brake shoe on the car, the lever shaft, gearbox derailleur , the tractor camshaft drive gears and passive suspension balancer shafts, bushings and other internal and external balancer; in heavy, medium machinery manufacturing industry, such as forging or pressing the rod, hook and loop, lever, sleeve and fixtures. Low carbon steel carburizing: low carbon steel carbon content of more than 0.15% by carburizing quenching, tempering after treatment requirements for applications requiring high surface hardness, good wear resistance, shafts, bushings, sprockets, and some plastics molds and other parts. Low-carbon steel by carburizing quenching and tempering to obtain a surface treated for high carbon martensite, the center of a low-carbon martensite, thus ensuring the surface with high hardness, high wear resistance and heart Ministry has very good strength, toughness. Handbrake shoes suitable for the production, the lever shaft, gearbox derailleur, drive a tractor driven gear and camshaft, hanging balancer shaft balancer inside and outside the bushings, sleeves, clamps and other parts. 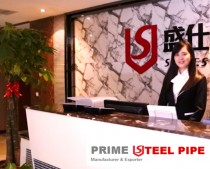 Carbon steel: carbon content of 0.25% to 0.60% of carbon steel, due to an increase in steel pearlite content, its strength and hardness increase over the previous hardness after quenching can be significantly increased. High strength quenched and tempered carbon steel, has a certain plasticity and toughness, good machinability, using quenching get good mechanical properties, hardenability poor. For the manufacture of high strength requirements, toughness middle parts. Typically used in quenched and tempered or normalized state. In order to make the necessary toughness of steel and eliminate the residual stress should be after quenching and tempering of steel into patenting.